Rosa Crawford of the TUC. The trade in service agreement (TiSA) might sound like something technical but don’t be fooled, it poses serious threats to workers’ rights, our public services and sovereignty. 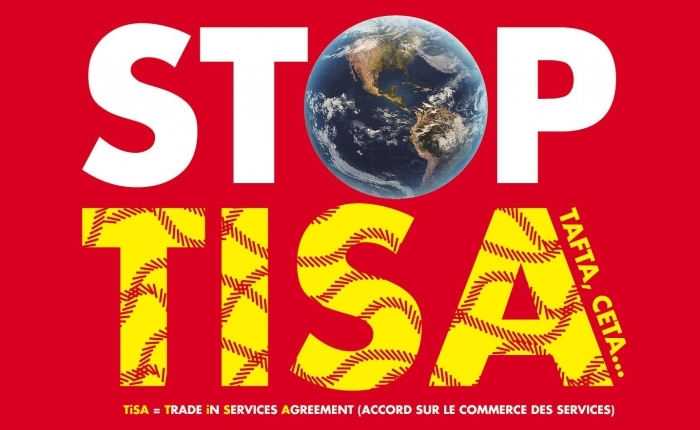 TiSA is a trade agreement that is being negotiated between 50 countries including all those countries in the EU. The UK has been one of the major cheerleaders for the deal while in the EU and the government white paper released in July made clear that the UK was eager to sign up to TiSA after Brexit. In fact trade minister Liam Fox is so keen on TiSA, he’s said it should set the model for other trade deals in services. This is worrying news for workers – and a little strange for someone so insistent that he wants to bring sovereignty back to the UK. TiSA would impose serious restrictions on government’s ability to pass laws and regulations, particularly on workers’ rights and other social regulations. That’s because, unlike traditional trade agreements that only cover trade in goods (like cars) TiSA covers trade in services (eg. a pharmaceutical company doing business in another country). 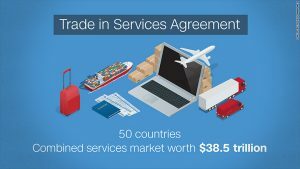 TiSA aims to make this trade in services easier by removing obstacles that might get in companies’ way. However, because of the way TiSA is drawn up, the kind of ‘obstacles’ it could strike down include national minimum wage laws, requirements to respect collective bargaining and freedom of association or laws for environmental protection. TiSA will also restrict government’s ability to run public services for the public good. That’s because the majority of the UK’s health, education, transport and other public services are included in TiSA which means the regulations for these services – such as drug safety rules or agreements on pay for nurses – could be challenged as ‘obstacles’ to trade (in this case their ability to win contracts to run privatised parts of our public services). TiSA also contains what is known as a ‘ratchet’ clause that prevents privatised parts of the public sector being renationalised. So it isn’t just Liam Fox’s great friend Donald Trump that poses a threat to our health services but TiSA – and all trade in services deals like it that he has recently was talking up at his recent visit to Washington. Workers are also under threat through TiSA as it fails to recognise workers as people with fundamental rights. Instead TiSA regards workers in service sectors as ‘service providers’, merely factors of production, without any reference in the deal to International Labour Organisation (ILO) standards or means for workers to claim these rights through TiSA. As services make up the overriding majority of the UK economy – and TiSA and the WTO are vague on the definition of jobs in the service sector – the number of workers that could be affected is huge. 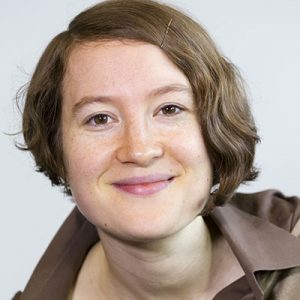 The scope for exploitation is huge, particularly for migrant workers brought in through TiSA who are particularly liable to be paid less and forced into poor conditions by unscrupulous employers. Such undercutting of course lowers conditions and pay for all workers. Trade unions in the UK and across the world are clear: TiSA and all deals like it that seek to liberalise trade in services without guarantees for workers’ rights, social and environmental regulations or deliver quality public services must be dropped. If services are included in trade deals there must be legally enforceable guarantees workers can claim their rights, social regulations will be upheld and governments have the ability to provide quality public services that are in public control. The single market is the only trade deal in services in the world to provide these guarantees which is why the TUC is campaigning for single market membership for any Brexit deal. This entry was posted in Campaign For Trade Union Freedom News, European Employment Rights, International Employment Rights, New Generation Of Trade Agreements, UK Employment Rights. Bookmark the permalink.